In this episode, we do a deep dive into the Pepsi ad fiasco and what might have been the reason for such a spectacular misstep, followed closely by an exploration of Dennis Publishing and how they’ve unlocked the only content business model that matters. Our rants and raves include advertising blinders and smartphone addiction; then we close the show with an example of the week from Farmer-Stockman Insurance. PowerPost: Welcome to the Age of Power Publishing: As content marketers, we understand the importance of creating content that not only educates, but also inspires consumers to take action. As a result, we have entered a new era of “brands as publishers” – where brands are increasingly becoming publishers in their own right. With brand publishing and content distribution comes several key steps to the publishing process. But the elongated process of content creation, review, scheduling, and tracking analytics can often take more time than we have. Built by marketers for marketers, PowerPost is a time-saving tool for companies who manage content for multiple brands with multiple users – whether it’s a regulated industry or creative agency. With PowerPost, your team can publish from one location across all of your online platforms, quickly and efficiently turning your brand into a power publisher. To help more brands excel at publishing, join us for a webinar on May 9th with CMI founder Joe Pulizzi. We have also created a comprehensive e-book, with insights from 50 experts in the content marketing field, and their strategies on con quering the five pillars of brand publishing: content planning, workflow, distribution, analytics, conversion. Claim your download at powerpost.digital. Anatomy of a content-by-committee failure (12:25): The Boston Globe gives an agonizing, blow-by-blow account of a Pepsi ad that was released (and pulled) last week. The spot, which featured Kardashian step-sibling Kendall Jenner, was pummeled on social media as a tepid and tone-deaf attempt to co-opt the emotion of U.S. political activism movements – like #BlackLivesMatter and the Women’s March – as a means to sell soda. What may have started out as a well-intentioned idea clearly got mangled in execution. Not only did it feel like a total topical mismatch for the normally fun-centric beverage brand, it reminds us of what can happen when the product and the brand get in the way of telling an interesting story. We just hope it won’t keep Pepsi from continuing to take risks. How Dennis Publishing’s willingness to pivot underpins its profitability (23:50): theMediaBriefing reports on a U.K. publishing company that is finding success in e-commerce by focusing on high-value transactions, rather than trying to go head-to-head with big players like Amazon. Dennis Publishing, recognized as The British Media Awards’ media company of the year in 2016 has monetized the audience of in-market car buyers it built, by creating an e-commerce site, buyacar.co.uk. As a case study, Dennis Publishing’s business model can teach content marketers a lot – a subject Robert and I talk about, at length, in our upcoming book Killing Marketing. Zazzle characterizes the state of U.K. content marketing in 2017 (36:48): Zazzle Media has released its latest report, which characterizes key trends and challenges currently facing content marketing practitioners in the U.K. The publication leaves me curious about the demographics that are reflected in the results, since there’s no mention of who participated in the study, the types of companies they work for, or how many respondents there were. Take note: If you create original research and claim to have definitive information related to your industry, you need to be transparent about who and where your data is coming from. Robert’s rant: Robert came across an article in AdAge, in which agency holding company IPG’s Chairman-CEO, Michael Roth, derides the motivations and abilities of consulting companies, claiming that they don’t have what it takes to come up with iconic creative campaigns. Robert takes issue with his assertions; having plenty of experience with business transformations that have resulted from these types of trusted partnerships, Robert warns that anyone underestimating the skill and creativity of consultant groups should do so at their own peril. Joe’s rave: I followed a recent story on 60 Minutes, about the impact of smartphones on teens and adults, from the broadcast to the CBS News site, where I found a fountain of useful information on smartphone and app addiction. As segment correspondent Anderson Cooper discusses, the goal of engineers at app companies and smartphone manufacturers is to get consumers hooked on checking their devices more and more frequently – and they are doing it in some surprising and sneaky ways. Cooper is quickly becoming the network’s go-to media expert on the subject, and if you have some time to spare, I encourage you to check out a few of his other conversations on the topic. This week, we have a story that may not fit our typical This Old Marketing mold, but it has too many interesting twists, turns, and connections to content marketing for us to ignore: Robert came across an article in The Spokesman-Review from 1996, which talks about the sale of a portfolio of agricultural magazines to Chicago-based Farm Progress Companies Inc. At the time of the sale, Farm Progress already owned a publication called Prairie Farmer, which has been published consistently since the late 19th century (making it the oldest magazine in the U.S.). The first twist in the story is that Prairie Farmer is now owned by Penton Media – the company I left to form Content Marketing Institute. The second is that the seller, Northwest Farmer-Stockman Inc. began the publication, not as a way to generate advertising revenue, but rather as a way to enter the insurance business. The company’s pivot began in the 1980s, when it started using its agricultural magazines to offer up specialized insurance for farmers, based on its in-depth understanding of its audience’s needs and interests. But what makes this a truly remarkable example of This Old Marketing is that, as part of the company’s original deal with Farmer’s Progress, the company would retain exclusive rights to provide insurance services to subscribers for a period of 20 years after the sale. 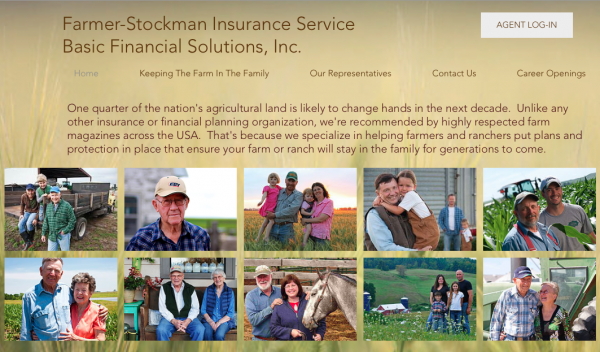 If you visit the Farmer-Stockman site today, you’ll see that it still operates as an insurance company, and it continues to position itself as the only insurance and financial service organization recommended to subscribers of multiple farmer’s magazines – including many that hadn’t been part of the Farmer’s Progress deal.